The global market for organic soy protein is estimated to be valued at USD 225.8 Million in 2016, and is projected to reach USD 500.4 Million by 2021. In terms of volume, the market is expected to reach 175.8 KT by 2021 at a CAGR of 12.2% for the forecast period. The growth of the organic soy protein market is attributed to the rising demand for organic products, government support for organic farming, growing vegan population, and high nutritional value of soy. With the growing awareness of health and nutritional benefits of organic foods among the consumers and the multiple end-use applications of soy protein, the demand for organic soy protein is expected to enhance the market growth from 2016 to 2021. Awareness and usage of plant-based protein is growing and soy is by far the most widely used plant-based protein source. These factors have led to the adoption of organic soy protein in various food applications such as functional foods manufacturing industries, among others. A change in the consumer pattern toward organic, healthy, and nutritious food products in regions such as North America, Europe, and Asia-Pacific has led to the growth of the organic soy protein market. Rising spending capacity of the consumers in developing countries such as India and China poses an opportunity for manufacturers to enter emerging markets. Currently, the manufacturers of organic soy protein use a combination of high-quality food technology and production techniques as well as continuous R&D to improve the nutritive value of the organic soy protein products. Applications of organic soy proteins are expected to rise in various foods due to product innovation and the rising consumption of convenience food and functional foods, globally. The objectives of this study are to define, segment, and project the size of the organic soy protein market based on type, application, form and region. To project the size of the market, in terms of value & volume, with respect to the four regions (along with their respective key countries): North America, Europe, Asia-Pacific, and the Rest of the World (RoW). In addition to the regions, market is also segmented into countries. Major countries considered for the report are US, Canada, Mexico, UK, Germany, China, Japan, among others. This report includes estimations of market sizes for volume (KT) and value (USD million). As a part of the market engineering process, both top-down and bottom-up approaches were extensively used along with data triangulation methods to estimate and forecast the size of overall market segments listed in this report. Extensive qualitative and quantitative data was analyzed on the complete market engineering process to provide key information and insights throughout the report. In the secondary research process, various secondary sources were referred to so as to identify and collect information. These secondary sources included annual reports, press releases & investor presentations of companies, white papers, certified publications, articles from recognized authors, gold standard & silver standard websites, food safety organizations, regulatory bodies, trade directories, and databases. The primary sources are mainly several industry experts from core and related industries and preferred suppliers, manufacturers, and distributors. In-depth interviews have been conducted with various primary respondents, including key industry participants, subject matter experts (SMEs), C-level executives of key market players, and industry consultants among other experts to obtain and validate critical qualitative and quantitative information as well as to assess future prospects. The figure below shows the breakdown of profiles of industry experts who participated in the primary discussions. Key participants in the supply chain of organic soy protein are raw material suppliers, government bodies, distributors, and end users such as the functional foods, infant formula, bakery & confectionery, dairy alternatives, and meat alternatives industries. 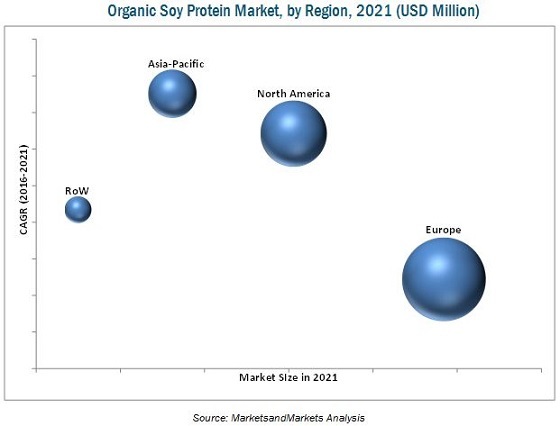 The key players involved in organic soy protein market include Harvest Innovations (U.S.), World Food Processing (U.S.), Devansoy Inc. (U.S.), The Scoular Company (U.S.), and SunOpta Inc. (Canada). Other players include FRANK Food Products (Netherlands), Hodgson Mill (U.S.), Agrawal Oil & Biocheam (India), Biopress S.A.S. (France) and Natural Products, Inc. (U.S.). The global market is segmented on the basis of type into soy protein concentrates, soy protein isolates, soy protein flour, and others. The isolates segment is projected to grow at a higher rate in terms of value as well as volume during the forecast period. This is attributed to the increasing demand for isolates by soy protein products manufacturers. On the basis of form, the market is segmented into dry and liquid. The dry segment accounted for the largest market share in 2015. However, the liquid form segment is projected to grow at higher rate during the forecast period due to increasing demand for soymilk. On the basis of application, the market is segmented into functional foods, infant formula, bakery & confectionery, meat alternatives, dairy alternatives, and others. Among these, the dairy alternatives segment is projected to grow at the highest rate during the forecast period. The functional foods segment dominated the organic soy protein market due to high nutritional value of soy protein, which in turn increases the demand for organic soy protein. The market is segmented on the basis of region into North America, Europe, Asia-Pacific, and the Rest of the World (RoW). In 2015, Europe dominated the global market, in terms of value as well as volume, due to the developed food & beverage industry in the region. It was followed by North America and Asia-Pacific. Asia-Pacific is projected to be the fastest-growing region in the organic soy protein market, in terms of value and volume, during the forecast period. North America is projected to be the second-fastest growing market. These two regions are projected to be primary revenue pockets for the market due to the continuous increase in demand for organic soy protein owing to the increased demand from different end-use applications. The high nutritional value, multi-functionality, and applications of organic soy protein, coupled with the growing demand from the food & beverage industry, drive the organic soy protein market. However, the high cost of organic foods is restraining the market. The organic soy protein market is fragmented and competitive, with a large number of players operating at regional and local levels. The key players in the market adopted expansions as their preferred growth strategy. Key players such as Harvest Innovations (U.S.), World Food Processing (U.S.), Devansoy Inc. (U.S.), The Scoular Company (U.S.), and SunOpta Inc. (Canada) have been profiled in the report. Other players include FRANK Food Products (Netherlands), Hodgson Mill (U.S.), Agrawal Oil & BioCheam (India), Biopress S.A.S. (France), and Natural Products, Inc. (U.S.).